It’s that dreaded time of year. Where ever you go, you see sick people. As you travel around, participate in activities or have children participating in their activities, often we are along side other’s with runny noses and coughs. You can’t do much than watch in horror as the sneezes and coughs attack everything everywhere! Is getting sick the inevitable outcome of the season? Or is there more we can do in our own homes to boost our immunity? Many of our 21 day fix recipes are filled with immunity boosting foods! It is important to include a diet of nutrient-dense foods. It’s something you need to be doing consistently to help your immune systems be as strong as possible. I can’t promise you that you will completely safeguard you and your children. But, being proactive instead of reactive will help you so much. So let’s talk about 21 day fix immune boosting foods from your pantry that are best to incorporate into your fall and winter meal plans. Black beans and spinach are high in magnesium – these nutrients are critical to supporting your body through fatigue. Spinach is full of many of the vitamins and minerals that boost our immune systems. It has vitamin A, E, C, and K, folate, manganese, zinc, selenium, and iron. Spinach gives you a great boost for just a little price tag! While red peppers have 3times the calcium than oranges! Isn’t that crazy?! They also have antioxidant and anti-inflammatory benefits. Many of us decide that carbs are our BFFs when we are beginning to not feel so well. But it is important to remember nutrient-dense, fiber-rich whole foods tend to promote a healthy bacterial balance, which is why a balanced whole foods diet is your best insurance against all kinds of viruses and infections. It has been shown that when you are low in vitamin D, you may be inclined to illness. Adding in eggs , such as in egg cups or one pan skillets will add in more vitamin D. Eggs also include a number of other immune-boosting nutrients, such as B vitamins. Making veggie egg cups with spinach will also give you a boost. These 21 Day Fix Immune Boosting Recipes are the perfect way to keep healthy all season long. Healthy Starbucks Egg Bites Save some cash and calories when you make your very own copy cat version of these tasty treats! 3/4R, .5B – I don’t count the green since it’s 1/7th of a green container. 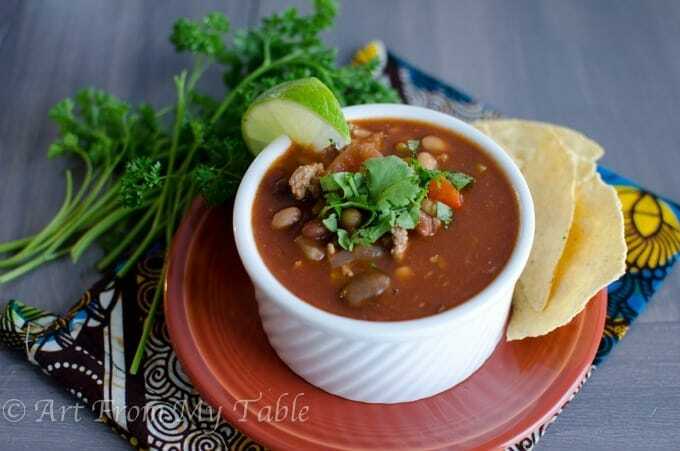 Chili has many beneficial ingredients that offer immunity support. Rich tomatoes, onions, garlic, peppers and so many spices make chili an awesome immune boosting fiber packed healthy option. When you can’t afford to be sick, and cough, cold and flu season is banging down your door. Be sure to wash your hands and strengthen your immune system with a natural and healthy soup or stew. Nose is stuffy, scratchy throat, pajamas calling your name…this can only mean one thing – a big batch of comforting stew, only one ladle away. 21 Day Fix Instant Pot Split Pea Soup Double up on your veggies and cut back on your peas to reduce the number of yellow containers you are using with instant pot recipe. 1 Red, 1 Yellow, 1 Green ,1 tsp. Oatmeal. It can be the dreaded yellow container breakfast or 21 day fix immune booster! The choice is yours! The beta-glucan found in oats helps boost our infection-fighting blood cells. Oats also contain selenium and zinc, two important nutrients for warding off infection and helping you stay in fighting shape. Smoothies can be a great way to start your day, when you utilize all of the right ingredients that will help you to stay fuller longer by including fiber, protein, fruits, vegetables, and chia seeds. For example, spinach is known for their metabolism boosting properties and Greek yogurt is filled with B12, high in potassium and low in sodium, rich in calcium. Many of these recipes below include in season vegetables and fruits and are 21 day fix friendly. Apple Cinnamon Smoothie– Whether you add a protein powder or greek yogurt this protein packed smoothie will have you feling all the fall vibes!